So you remember that time when I ran a marathon and then only updated my blog twice before running another marathon? That was awesome. On November 7th, 2010, I took part in the world’s biggest foot race, the New York City Marathon. 26.2 miles through all 5 Boroughs of New York City starting on Staten Island, running through Brooklyn, Queens, The Bronx and finally winding down in Central Park in Manhattan. The experience was amazing and I am so glad that I did it. I trained for 18 weeks for 4 hours in New York City. Unreal but soooo worth it. This was my second marathon ever and I was shooting for sub-four hours but did not know how to realistically set my goal because of the number of people in the race… 45,500. I figured it would be slower due to the logistics, but wanted to try my best to get 4 hours. The morning of the race, I got up from one of the best nights of sleep I had in sometime. I had gone to bed at 8:30pm Eastern Time, slept the entire time, including the hour that we “fell back” and woke up at 4:30am. I put on my running gear, which included my #22 Jeff Green Oklahoma City Thunder jersey, and had my brother-in-law take me down to the Staten Island Ferry. I got there around 5:30 and my ferry was supposed to leave at 6:15 but decided to wait it out and leave around 7:00 knowing that all there was to do while on Staten Island was sit in the cold. I jumped on the ferry right at dawn as the sun was coming up over Brooklyn (an amazing sight). Twenty minute ride over to Staten Island where I literally sat and waited in the 35 degree temperature for 2 1/2 hours until my start time at 10:10am. This is where the fun begins… the start. We were led up to the Verrazano-Narrows Bridge, which connects Staten Island to Brooklyn and we were off! One mile uphill on the bridge and one mile downhill to Brooklyn. This was one of the more surreal moments during the 26.2 miles. There were so many people racing and there were so many people racing in good spirits at this point in time. Everyone was excited to be where they were after many months of training, it all came down to this. I had my gloves on and was running in a beanie that Dunkin’ Donuts handed out while waiting because starting temperature on the bridge was 40 degrees so it was a little chilly above the water on that bridge. I remember more from this marathon because I was just trying to take everything in while running and not really focus on the running part, so I am going to break it down into bullet points of what I was thinking when I was thinking it… here goes! Mile 2 – Really, my shoe came untied already!? Brooklyn. It’s weird running down a street in NYC that I know very well… 4th Ave. For sure a different vantage point this time. Mile 3-6 – I am so glad that I wore this Thunder jersey. Everyone keeps cheering and saying “Go Thunder” and “Go Kevin Durant!” even though it was a Jeff Green jersey. Mile 7 – Look there are some OSU flags!! There is my Mom, Dad, Sister and Brother-in-law. I am so glad they made this trip to watch me. It was a great moment that boosted me. I saw them one more time on the route and that time was even more important. Mile 8 – 4th Ave and Presidents Street – Looking for Caroline to see if she made it out to watch, I see her house which is pretty awesome to recognize a place you know while running the NYC Marathon. 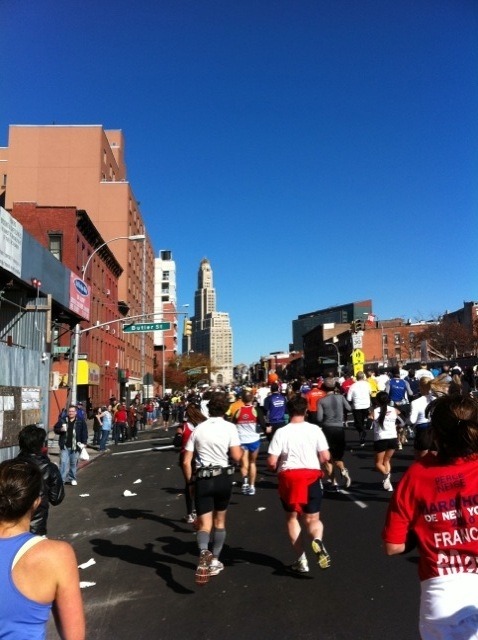 Mile 9-13.1 – I really just remember seeing a ton of people as we finished up running through the rest of Brooklyn. Mile 13.1 – Only half way!? Entering Queens now. Mile 15.5 – Crossing the Queensboro Bridge into Manhattan. This was another surreal moment. For the first time in the marathon, there is no one on the road except for runners. No fans, no noise, just you and the road. You can hear yourself breathe and think for the first time. Things kind of start to sink in about your whole experience as well as the pain. This was one of my favorite moments during the race. Mile 16 – Coming off the bridge onto 1st Ave in Manhattan. This was the craziest section of the race. People here were going nuts and they were everywhere! I saw my family one last time on 1st Ave but only for a brief moment and then I was past them again. Mile 17 – My left foot is numb because my toe had been slamming against the front of my shoe this entire time. *My middle toenail is still black because of this (it’s November 26th right now). Mile 19-22 – I honestly don’t remember a whole lot from this part of the race. We crossed two bridges I know. One going into the Bronx and the other coming back into Manhattan from the Bronx. Mile 23 – *hitting the wall. This was the first time that I started to really struggle. I was 3 miles from finished the New York City Marathon. My quads were really really tight and were beginning to really hurt. At this point, I stopped for a moment, walked to the curb and brought my leg up to stretch out my right quad… bad idea. Immediately, my right hamstring balled up and a pain shot through my body. I thought to myself, “No way this is happening right now.” I brought my leg back down, stood for about 30 seconds not moving waiting for my hamstring to go back to its normal position. Finally it did and I limped into my run again… as soon as I did that, it felt great again. It was the weirdest deal but thankfully, didn’t stop me completely. Mile 24 – Entering Central Park. When you think of Central Park, you think of all the beautiful pictures you’ve seen of the place and how open it is in the middle of NYC. What they don’t tell you is that it is full of tiny hills and inclines that really do a number on you when you’re on mile 24, 25 and 26 during a marathon. These hills were sneaky because you are very tired at this point and you are just waiting til you see that “FINISH” sign. Complete torture. Mile 25.6 – What I thought was the finish just beyond this final stretch…It wasn’t. It was just the final stretch before turning onto the final stretch. Very deflating to think you are almost there only to find out that there is still .4 miles to go. Mile 26.2 – FINISHED – 4:00:08!! Legs hurt to no end but so excited that I finished. That was ultimately my goal.. to finish and I did it! Now, you have to wind your way up and down these small little hills again just to get out of Central Park. Taxis should have been there waiting. The New York City Marathon was so memorable. I will never forget any part of that trip, run, experience…. except for those parts where I blacked out in the middle of it all. Maybe one day, I’ll try and do this run again. We’ll see. I LOOOOOOOVVVEEE NEEEWWW YOORRRKKK *as said in a VH1 “I Love New York” Episode ending way. You know what I’m talking about. Don’t pretend you are too good for VH1 reality shows.